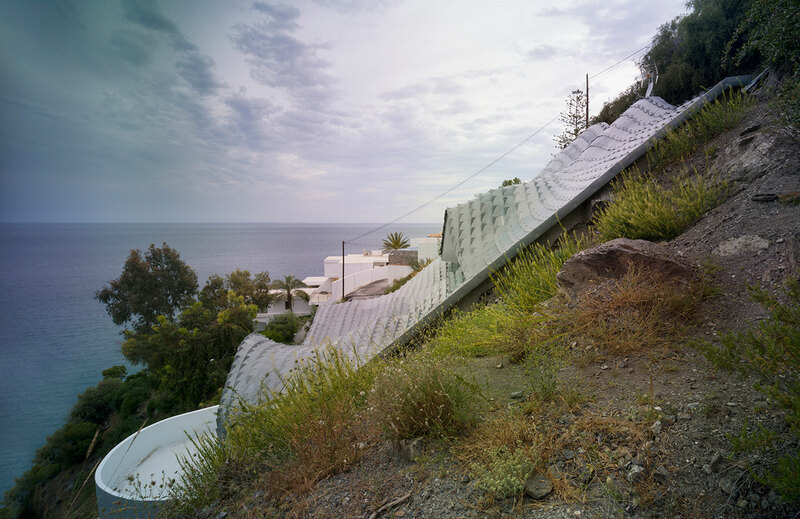 Pablo Gil and Jaime Bartolome, of GilBartolome Architects have expounded upon the concept of extreme living with Casa Del Acantilado in Grenada, Spain. 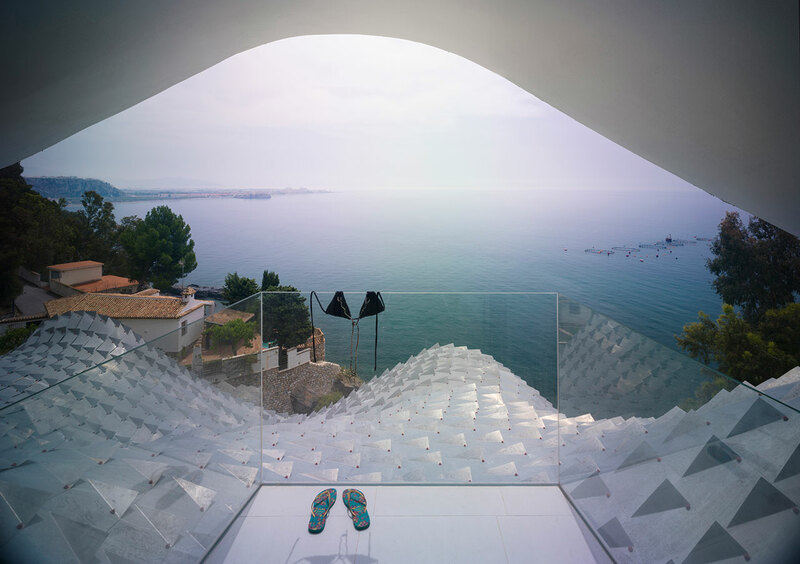 Completed in 2015 for a young couple with an imagination as limitless as the architects but with a finite budget, at first sight the home looks like the lovechild between a futuristic spaceship and a mythical sea creature scaling the heights of the cliff face. 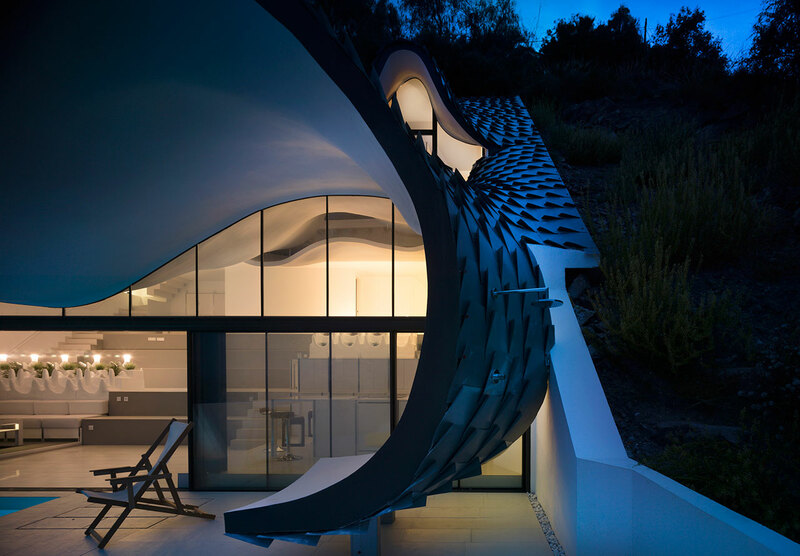 A study of juxtapositions, the unique design of its organic shapes both cause the home to stand out as well as fit into the jagged and complex landscape. The remarkable Mediterranean views are enveloped by the home’s living spaces and embraced through the wide, movable glass façade which retracts to blend the out with the in. 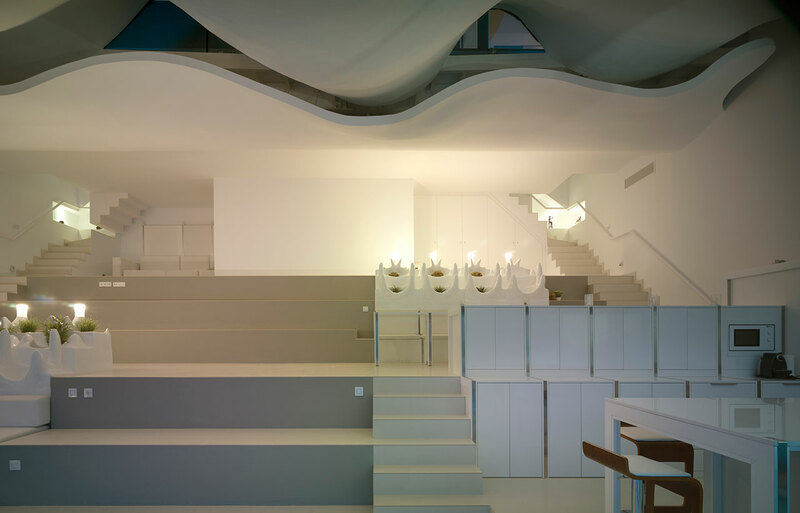 Hence, the cantilevered patio on the first floor connects the auditorium-like living area inside with the swimming pool outside, making the space flexible enough to fit a party of seventy people, if need be. 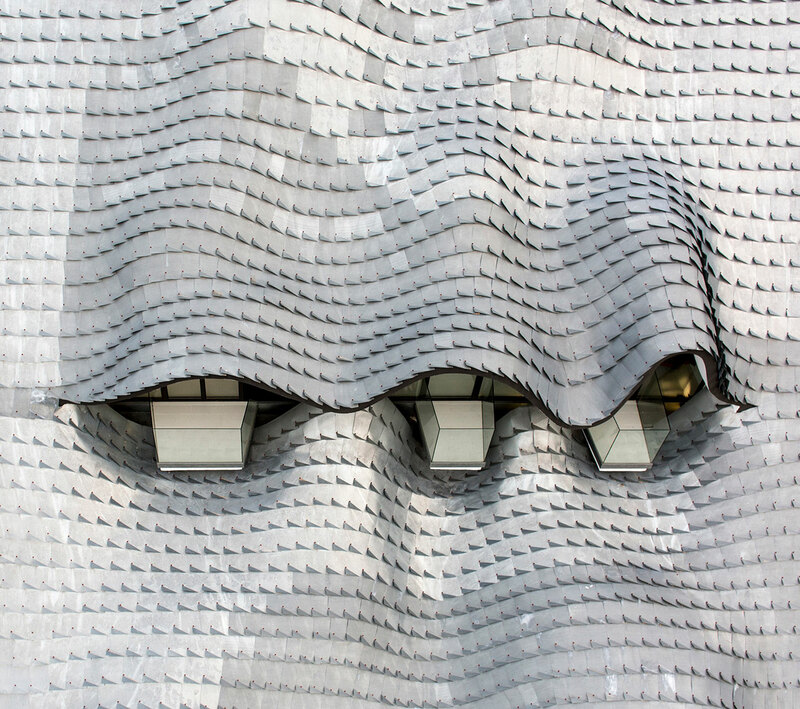 Meanwhile, the private rooms on the second floor all offer unique views through the roof which was handcrafted out of a metal mesh developed by local engineer, Dr. Manuel Rojas, and finished with hand-placed zinc scales. 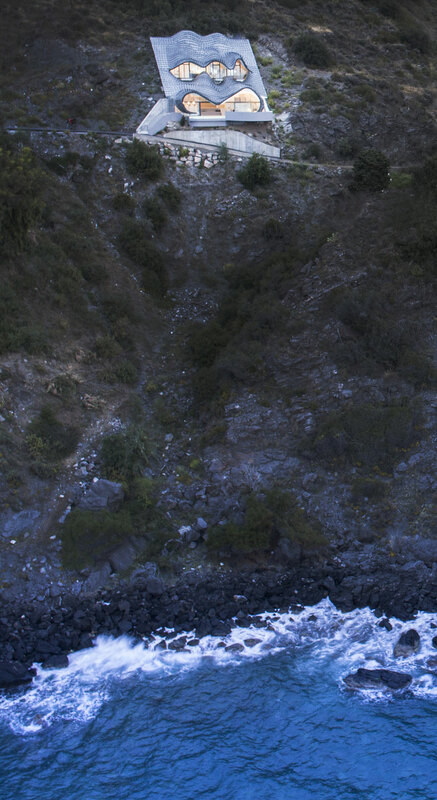 Although at first glance, the way in which the property is perched on the edge of a 42 degree incline may seem precarious, the edifice is buried so deep within the mountain’s rock that it is actually integrated into it. Other than creating an impressive image, the attributes this modern cave-house carves out for its inhabitants are even more remarkable. The ground’s constant 19.5°C temperature; the 40 cm air cavity between the interior and retaining walls; and the curved double shell of reinforced and insulated concrete which surrounds the living spaces and roof, all collaborate to both cool and warm the home as needed, therefore eliminating the use of artificial air conditioning year-round. All of the elements that make this house so unique—from the metal formwork necessary for the concrete roof, to the zinc tiles and the gypsum plaster ceilings—were handmade and hand placed requiring countless hours of labor. 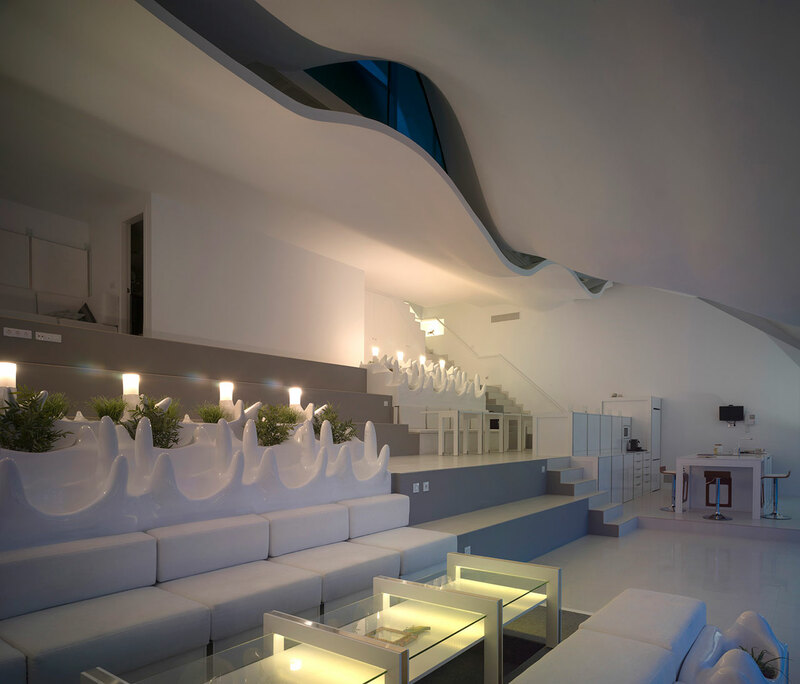 Even the bespoke fiberglass and polyester resin interior furniture, which looks to have been inspired by the white froth created by the crashing waves below, was designed on digital design software and ultimately manufactured on site by skilled workers. Fine craftsmanship, notable sustainability and the embracing of remarkable surroundings all make Casa Del Acantilado’s ingenious design stand out in more ways than one.